Sleeping Bear Dunes National Lakeshore was recently named the most beautiful place in the United States of America by Good Morning America. With good reason, the dunes found here are truly amazing. The park is a wonderful display of conservation and preservation at its finest, flora and fauna are living healthy in their natural environment. Sleeping Bear Dunes is very diverse, dunes are found on the face as well as the backside of the park, one pointing inland, the other pointing towards Lake Michigan. This diversity creates a unique contrast of both scenery and emotion. Anyone can easily find an area that fills his or her eyes with beauty, while bringing an overwhelming feeling of relaxation. Sleeping Bear Dunes NLS is truly a hidden paradise, like many other locations scattered throughout Northern Michigan. The image seen above was taken from South Manitou Island of the Sleeping bear Dune Nation Lakeshore. 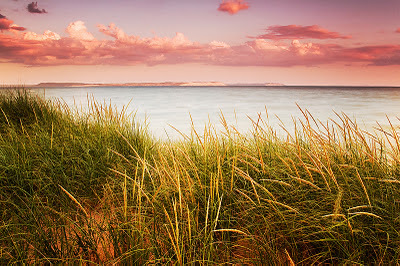 The image features the Sleeping Bear Dunes facing Lake Michigan, complimented by dune grass glowing in the warm evening light. The Manitou Islands are also a hidden treasure of Northern Michigan just waiting to be seen.